← Selamat Hari Gawai! Selamat Hari Kaamatan! World Cup Fever? Is this Khairy’s version of a joke? Or a warning to football fans about fake MCs? Three civil servants of the Negri Sembilan Islamic Affairs Department (JHEAINS) were charged at a Magistrate’s Court in Seremban today with using fake medical certificates (MCs). 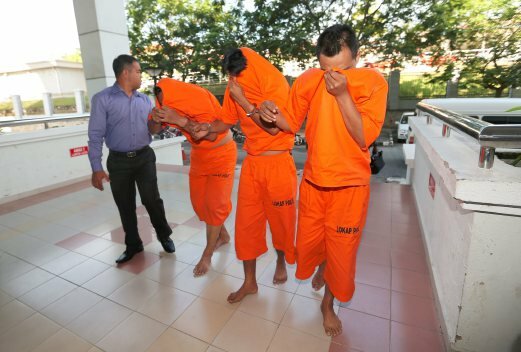 Mazlan Ahmad, 48, Rosyanizam Yahya, 38, and Muhamad Hafiz Mohamad Sarpan, 33, pleaded not guilty before Magistrate Rahimah Rahim. Mazlan faced three charges of using fake MCs between Nov 2 and Dec 12, last year while Muhamad Hafiz faced four counts of using fake MCs between Feb 27, 2014 and Nov 11, last year. Rosyanizam faced 13 counts between Dec 22, 2014 and April 18, this year. All the offences were committed at JHEAINS. This entry was posted in Uncategorized and tagged crime in malaysia, fake MCs, malaysia. Bookmark the permalink.